Each incoming PhD student is assigned a faculty advisor who, in conjunction with the Director of Graduate Studies, will recommend a suitable program of philosophy courses. Students are expected to acquire a broad competence in both history and contemporary problems of philosophy and to develop an area of specialization prior to undertaking formal research for a doctoral thesis (see breadth requirements). The Advisor and the Director of Graduate Studies will be responsible for overseeing students’ progress until the student has completed the course and breadth requirements and constituted a Thesis Committee. The Thesis Committee, consisting normally of three faculty members, assists the student in defining an area of specialized research within which he or she intends to write a dissertation. The Thesis Committee guides the student through the Qualifying Year as well as through the writing and defence of their dissertation. 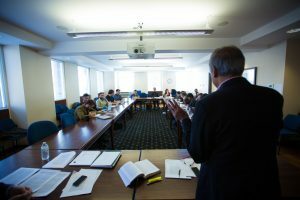 In the Qualifying Year, the Committee approves a Research Reading List and guides the student in the writing of an (article-length) Qualifying Paper. On the basis of the paper and written and oral Qualifying Exams, the Committee then determines whether the candidate has met the Qualifying Requirement and can begin formal research for the thesis. After satisfying the Qualifying Requirement, the student selects a member of the Thesis Committee to be the Thesis Supervisor. The student remains under the guidance of the Thesis Committee through the final Oral Defence of the finished dissertation. Thesis Committees are required to provide regular reports of progress made by their students. Doctoral students are expected to proceed through the program without interruption. Leaves of absence on medical or personal grounds for a period of up to three terms (one academic year) require documentation. The leave of absence policy is detailed on the School of Graduate Studies website. Consult this Four-Year PhD Timeline, which summarizes the department’s due dates for each requirement. In order to remain in good standing in the department, a student must complete each requirement by its due date. A student who falls out of good standing in the department is no longer guaranteed funding and no longer guaranteed a spot in the PhD program.